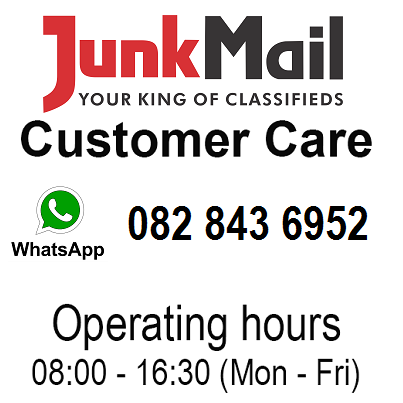 Junk Mail Customer Care is now on WhatsApp during the week and normal office hours 08:00 – 16:30 from Mondays to Fridays. Simply add the number 082 843 6952 to your phone contacts and save it as Junk Mail Customer Care. Start your query with your name followed by your query details. Only WhatsApp queries will be taken through this number; no calls, SMS’s or other IM apps. You can also send your success story using Junk Mail to this number via WhatsApp. So feel free to contact Junk Mail from your mobile phone today! I’m trying for months to advertise my car for sale. I cannot fill in the price slot. It always comes up as not done. Please help. I write it like this, 55 000 00, or 55 000,00, or 55000,00. Tried so many formats. But still no go. :’-( what am I doing wrong? There are a few available on Junk Mail. Simply click here to get in contact with the sellers! Make sure to always add as many photos as possible! You can also see if the price for the property is market related by going through other adverts in your region with the same details. I see the ads did have quite a few phone clicks, so perhaps ask people phoning where they saw the ad to give you peace of mind! Click here for a list of diesel engines available for sale on Junk Mail. I need second hand air conditioners in Neslpruit,White River and Louis trichardt. I have registered on your classified web. Mean while I want to buy farm tractor/machinery to ship to Zimbabwe for own use. I will in future look for machinery for resale. So I need genuine sellers. Mean while help me to get a cheap good small tractor for my use. Please click here to view tractors for sale on Junk Mail. Thanks for registering as a regular user! Welcome to Allseason Lawns website! At Allseasonlawns we understand what “green” is all about. We have been in business for more than 10 years and we have served an inumerable number of very happy and satisfied customers. Any one who can assist me Fiat Strada Parts, 1.2, 2006 model. Zululand chap. Ready to pay and collect. Junk mail is the best. What is junkmail doing with the fake adverts on the site, it is so evident that these adveerts are fake. Clearly one cannot buy a 2013 toyota hilux for R32000 and a mini cooper for R21000. Something needs to be done to stop this practice. People can easilu fall prey to these scams. We have a dedicated team of moderators looking at every ad on the site. These ads are removed as quickly as they are put on. But you are welcome to report anyy such ads using the report button on the ad details page. 1 large, 3 smaller oak coffee tables for sales R1 500 – tables too small for lounge. Please place a Free Junk Mail ad here: http://goo.gl/CeN43X and make sure your items are sold fast! Please contact our Sales Team by sending an email to premiumaccount@junkmail.co.za. Morning. Is there still life ant Junk Mail? No response on WhatsApp or email? I have listed about seven properties today on Junkmail. It showed as “successful” But could not find anyone on Junkmail. Please visit https://goo.gl/KSdWAB to see all spares available on Junk Mail. Thank you for bringing this to or attention. We always encourage people not to pay any form of fee if you have not seen the property in person or signed a contract. We will send the information you supplied to the relevant people. If you have any additional info, please feel free to send it to scam@junkmail.co.za. Please click here to place your ad on Junk Mail then follow the easy steps. How do I delete ads of junkmail ? I have tried deleting it but it just comes back everytime I log in. If you still have challenges, please let us know and we’ll take it further. My ads are deactivated, but I am unable to delete them. I have tried to and it says ad successfully removed/deleted but if I refresh it just comes back. Please assist me with this issue, I have viewed the link and I do what it says I should but the ads are still there. Please send and email to the Junk Mail Webmaster detailing your challenges, he will be able to assist you. We apologise for the inconvenience. We recently relaunched the Junk Mail website, and with that comes a few challenges. It will be sorted out ASAP. Please send an email to webmasterteam@junkmail.co.za and somebody will assist you as soon as possible.